characteristics. See those in Surface Types. Wide range of colors, textures, and finishes. Standard wall brick are approximately 3 1/2 inches high. "Thin Brick Veneer" are approximately 1/2" thick. "Used" or "Reclaimed" brick can be a very old brick of very high absorption and softness. They might also contain old sealers, paints, etc. that can effect sealer penetration and bonding. Test for highly variable absorption rates. 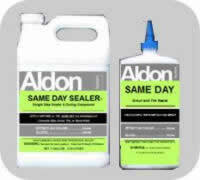 The correct sealer will increase the strength and durability of brick and mortar. That is very important for historical brick and mortar made before 1933. How do you know if the brick is concrete or clay? Concrete will fizz from a drop of swimming pool acid. Clay will not. See testing for acid sensitivity. Some batches and types of brick can be very absorbent and will tend to soak up a lot of sealer if you just keep pouring it on. Too decrease the amount of sealer required see the label suggestions. Traditional beauty. The great variety of colors and shapes allow for a wide spectrum of creative design. Highly textured brick are difficult to clean of residue from grouting. Do not use a sealer as a grout barrier ( pre-seal). 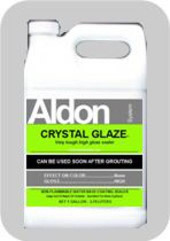 Prevent grout smears, surface scratching and keep grout residue out of surface texture by coating with Aldon Grout Easy before grouting. "Grout Easy" is a water soluble coating that comes off easily while grout is being cleaned up with water and a sponge. This product is used for "Thin Brick" with grout pumping to greatly reduce clean up time. Efflorescence (subsurface originating white powdery stains) happens all the time on brick structures. However, this is easily cleaned and can be prevented from coming back. Fading: . Actually clay brick do not fade. The appearance of fading is actually from light efflorescence and can be stopped by sealing with the appropriate Aldon sealer. See proof here. Very old brick (and its mortar) that are soft, crumbly, powdering - reinforce all of it with the choice of one of Aldon's "solvent based - penetrating" sealers shown below. For information on paving snow removal issues. #2. If the Brick is grouted, but never sealed. #3. If the Brick has had a sealer applied in the past. Note 1: A water drop absorbs immediately on a highly absorbent common red brick. If this does not happen on your brick it is either some other material that looks like a brick and needs to be treated differently. Or, it might have been sealed at some time and you should review this page. Note 2: Some batches of Brick will be much more absorbent than the average. This only means it has an even greater need for the sealer to penetrate deep down to make it more durable. Showing "Same Day Sealer" on Brick. This sealer is Water Base | Penetrating Type. Provides: No color enhancement or gloss. Coverage guidelines (depending on absorption) 250 to 600 sq.ft./gal. 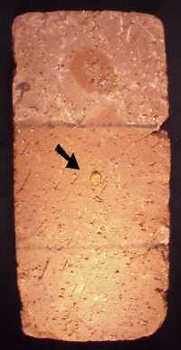 Picture: Top half: Raw unsealed sections = arrow at damp spot showing immediate absorption of a water drop. Bottom half: One Application of "Same Day Sealer". There is no change to color or gloss. Note water drop at arrow to show it is sealed. You can add one application of "Lifeguard" for a matte level gloss. You can increase gloss with more applications as desired. Showing "Crystal Glaze Sealer" on Brick. This sealer is | Water Based | Coating Type. Provides: little or no color enhancement and high gloss. Coverage guidelines (depending on absorption) 350 to 600 sq.ft./gal. One application of "Crystal Glaze" on a dense, low absorption brick. You can add one application of "Lifeguard" for gloss protection from traffic wear. 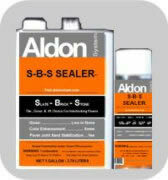 Showing "S-B-S Sealer" on Brick. This sealer is | Solvent Base | Penetrating Type. Provides: color enhancement | low gloss | strengthening | efflorescence barrier. Coverage guidelines (depending on absorption) 150 to 500 sq.ft./gal. Picture: One Application of "S-B-S Sealer" on a high absorption red common brick. Top third: Raw, unsealed. Note dark spot of immediately absorbed water drop. Middle: One good application of S-B-S Sealer = fully sealed, no gloss, a little color enhancement, note water drop at arrow to show it is sealed. Bottom: Two good applications. This is fine on a brick this absorbent but does not add to gloss or additional color enhancement. 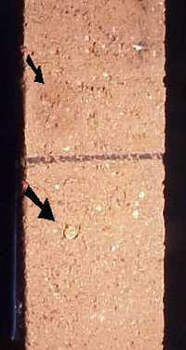 Showing "Porous Stone Sealer" on Brick. This sealer is | Solvent Base | Penetrating Type. Provides: color enhancement | medium-high gloss | strengthening | efflorescence barrier. Coverage guidelines (depending on absorption) 150 to 400 sq.ft./gal. 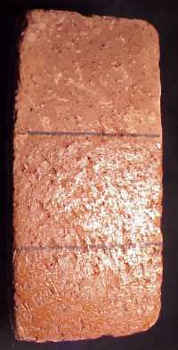 Picture: "Porous Stone Sealer" on a high absorption red common brick. Middle: One good application of "Porous Stone Sealer" = fully sealed, medium gloss, color enhancement. This is the best choice to customize the gloss level in the mid-range. Bottom: Three applications = higher gloss level, color enhanced. Note that "Mexiglaze" creates the same high gloss with fewer applications. Showing "Mexiglaze Sealer" on Brick. This sealer is | Solvent Base | Penetrating Type. Provides: color enhancement | high gloss | strengthening | efflorescence barrier. Coverage guidelines (depending on absorption) 75 to 400 sq.ft./gal. 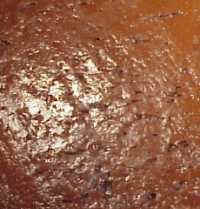 Picture - close up view: One application of "Mexiglaze" on a highly absorbent red common brick. One application = color enhanced, high gloss level. "Mexiglaze" is recommended for high absorption brick because the higher solids level means fewer gallons and that means lower cost. Easy Care Products: for a Brick floor. "Maintain" - for no streak wet mopping of Brick and all other types of flooring. You may have heard of concerns about Clay Brick. All of them would be prevented with the information we provide here. Therefore, you can have the look you want!